Go, Tracy, Go! : It's that time of year again! It's NYCM kick-off time! And by "kick-off," I mean: MARKETING TIME! Yes, that's right. 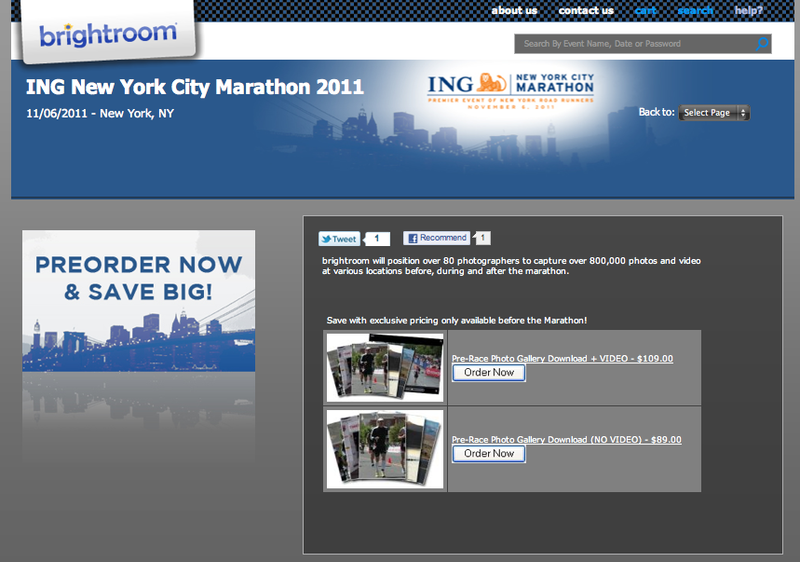 Six months before the race, two months before you're started your 14/16/18 week training schedule, well before the pictures have even been taken, for a mere $109, you have the option of buying a full photo package from brightroom. Never mind that brightroom seems to take some of the world's worst pictures... of me. May your luck be better. But for $109? I'll ride my bike next to you for 5-10 training runs until we've captured that perfect, effortless, wonderful running photo. I'll even shoot you from above, instead of below (like brightroom), for a more flattering angle. As someone I follow on twitter pointed out the other day, NYRR has now sent several emails selling stuff, but they haven't (yet) sent an email to let registrants know that they need to select a transportation option to get to the start. The transportation choices were posted nearly a week ago, and most people haven't noticed... but make sure to offer them a way to spend (more) money on the race! Finally, a serious note. (Okay, not that serious.) Yesterday afternoon, my ingenious poll had an amazing-unbelievable-thank-you-so-much 92 votes. By yesterday evening, it had 52. What gives? Blogger is frustrating these days. Maybe it's time for me to learn to code so I can create my own web site from scratch. Yeah - no. Anyway, please do continue to vote and comment if you haven't, even if I'm not sure your vote is being recorded. I've never gotten a good picture from Brightroom, either. The last few races I've run, it seems that the only photos they get of me are at the start and finish, and they've got 470 other people in them. No, thanks. So what did you select as your transportation? I'm baffled - and don't even know when I'm starting! And Dawn: I tried to find some brightroom photos to post to show how bad they are, but they were TOO bad for publicly posting. Much too bad. Since I'm gifted on the 'looking like crap in race photos' thing...I'm not buying that package. Enough said. As for transportation: I had several options, but picked the Team Hole in the Wall bus. Stupid? Should I pick the ferry? All the cool kids are taking the ferry? I was totally put off by the photo thing! The shirts are okay, but expensive! And I only noticed the transportation thing on their facebook page! What is up with that? I signed up for the bus, since I will likely be staying near Queens with my friends. I kind of wanted to take the ferry though. We'll see. Yeah and I'm pretty sure you will still have the option to purchase whatever they are selling after you've seen the pics. Man, marketing to runners have reached an all time low (or high, I suppose). Do they think we are rich or somethin'?!! Brightroom should be called Stalkeroom. Once they have your info, you get a million emails asking you to purchase the crappy photo they have taken of you. I am not into these Disneyland type marketing tactics. Whatever. The BEST race I've ever run was the Steamtown Marathon in Scranton, PA. Not only did they send weekly emails that were hilarious, but were informative. They also send you a pre-race packet with tons of info! Why can't the bigger races put that much effort into letting runners know what to expect than trying to sell them stuff. No apologies, Bridget. You've said something TOO TRUE.